This year for the first time I entered an internet swap. An exciting opportunity to meet, to create and to share. Amazingly my swap partner shared a love for knitting and vintage knitting patterns. I much enjoyed discovering her blog, Clutch Creations. At first no firm idea of what to make, other than wanting it to be natural, incorporate knitting and something to be enjoyed by the whole family. This little character emerged, rather iconic at that . As this character took shape it became such a delight to make. 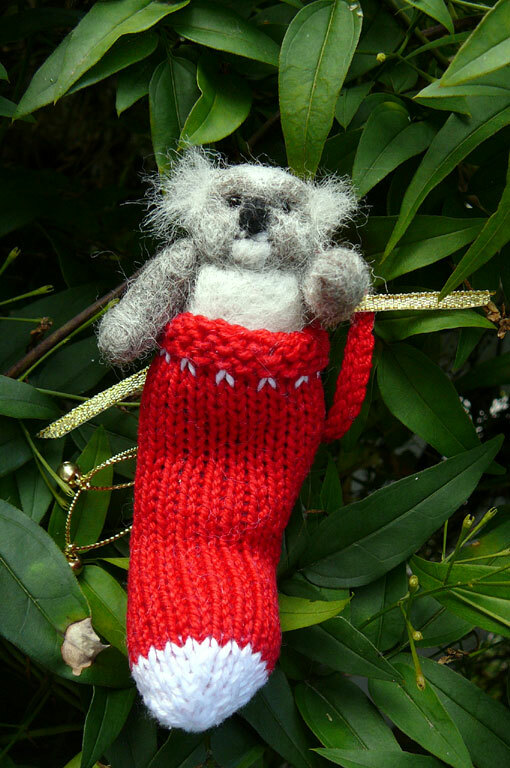 Christmas Koala was needlefelted from my imagination. 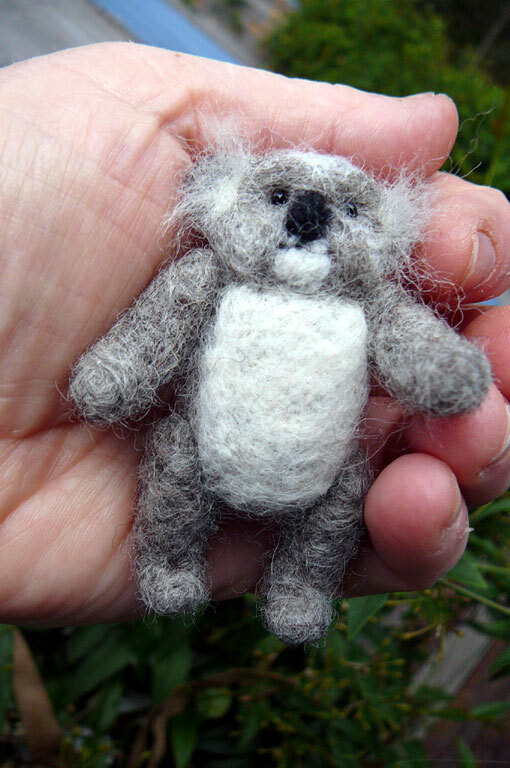 He was made from grey corriedale fleece and has moveable limbs that are string jointed. The cotton stocking is handknitted from a pattern designed by Little Cotton Rabbits. Please check out her site as it is beautiful. To give a bit of sparkle some gold ribbon and gold cord were attached ,a gold star covering the join and tiny jingle bells hanging from the cord. What also emerged from this challenge was an awareness that my knowledge about Koalas was very limited. Apart from the common knowledege that they eat gum leaves I knew that they were marsupials and under threat from disease, domestic animals and habitat destuction. This led to research and hopefully a better understanding and concern for their welfare. Now this little fellow resides in New Zealand and I hope becomes an endearing addition for the season. Having taken this first step have just completed and posted away another swap for the Southern Hemisphere Seasonal Exchange. This was an interesting challenge to come up with something handmade about summer and the season from a southern viewpoint, before posting I’d like my partner to see it first . This lil guy is absolutely adorable. You have done such a great job. He will love it in NZ! Yay! Thank you sooooo much. The little koala is gorgeous. As we don’t have a tree yet, he’s hanging on our dining room wall. I’ll be posting to my blog soon.